Disney seeks to right a social wrong by adding an African-American princess to its hallowed galley of snow white maidens. Anika Noni Rose gives voice to Tiana, a New Orleans girl with dreams of opening her own restaurant in the Big Easy, but like most of the female heroines in the line, she’s not really the center of attention. Nor for that matter is her charming cad Prince Naveen (Bruno Campos) despite his best efforts to dance and sing his way into our hearts. 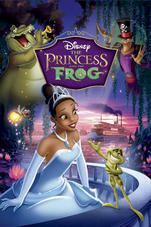 Usually it’s the villains or the magical creatures that have all the charisma, and, sadly, The Princess and the Frog, while full of magic and mild mayhem, lacks that full-bodied focal point. As voodoo priest Dr. Facilier, Keith David certainly has the deep vocal chops to strike the right tone of menace and mood, but it feels like the head cheese at the mouse house decided to play it safe in the face of such obvious potential insult.